We always love discovering a lesser known place and sharing our impressions with the hope that you’ll see how amazing it is. 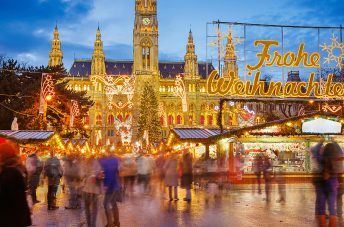 Especially when it’s a place in a kind of an underrated country or region – like the Balkans are. 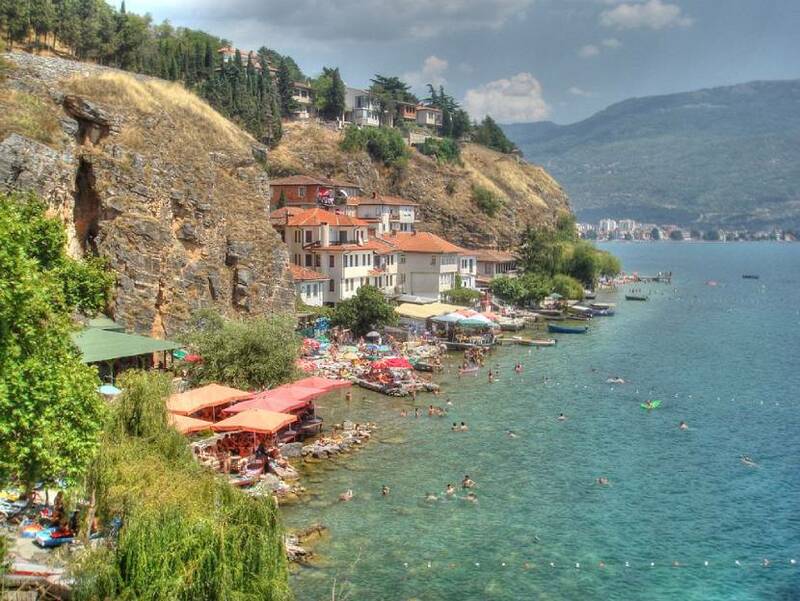 This time we’re discovering Ohrid – hidden gem of the Balkans. Because it’s located right next to Greece, FYR Macedonia is often overlooked and many people don’t even consider it for their vacation. But each country is totally worth of exploring and that’s why we’ve decided to explore FYR Macedonia, or to be more precise – its ancient town of Ohrid, set on the Ohrid Lake. Keep reading to see why we loved it so much. Download our Cultural Places App and add Ohrid to your personal trip planner. 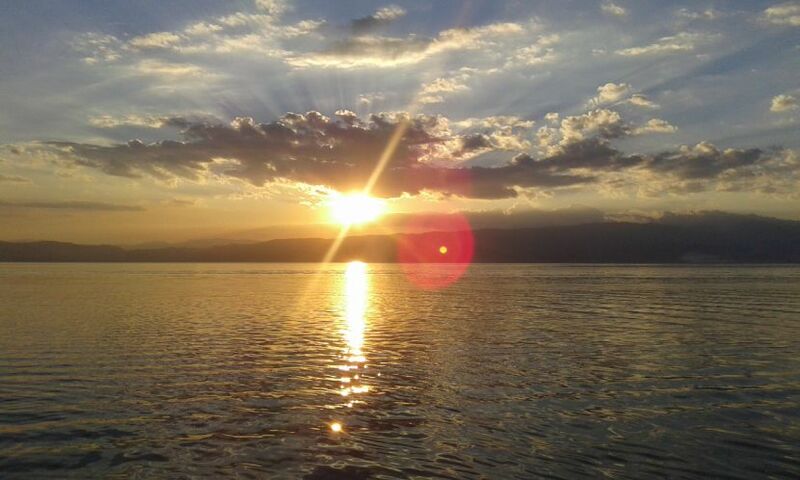 Lake Ohrid is known to be one of the largest, deepest and oldest lakes in Europe, it is often referred to as the sea of FYR Macedonia, and because of its large, clear, sparkly water surface, it sure does feel like a sea. The Lake is surrounded by mountains and that is also making it so serene. The water is lined with perfect stony beaches and cafes – just perfect to enjoy amazing sunsets. Also, you have to get on a boat and cruise around, that’s an experience you’ll never forget. Ohrid is a small city set on the north shore of the Lake and on the south of FYR Macedonia. The old town, or shall we better say the ancient town, is one of the oldest settlements in Europe – it was built between the 7th and 9th centuries. Old Town Ohrid is set on a little hill on the very shore of the Lake and it is crowded with houses from the Ottoman times and winding streets between them. One street that you have to stroll down is definitely the old Bazaar street – St. Clement of Ohrid, set in the foothill of Ohrid Old Down. 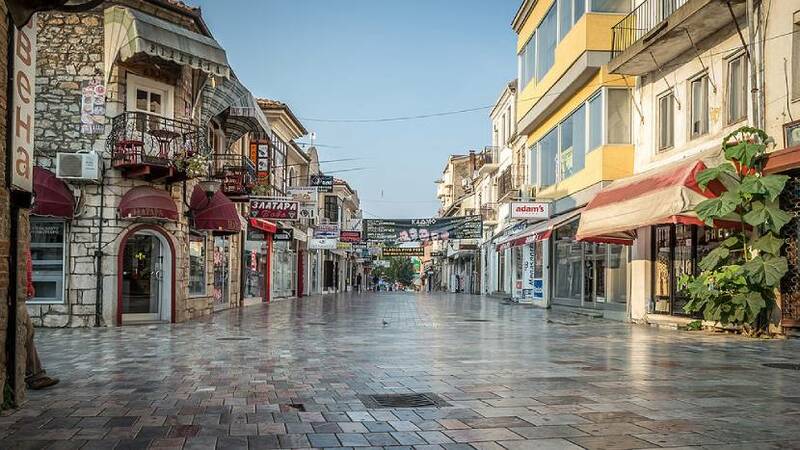 This marble street runs from the waterfront to the Ohrid Fountain Square and is lined with plenty of small shops and cafes that are set in old buildings. The Old Town of Ohrid is full of monasteries and churches, it is said that there are 365 of them and that is why Ohrid is known as Jerusalem of the Balkans. Those old churches are mostly built in old Byzantine style and they look pretty stunning. Some of the most famous ones are the Church of St. Sofia and St. John at Kaneo. The Church of St. Sofia is set in the Old town and is one of the most significant medieval churches. 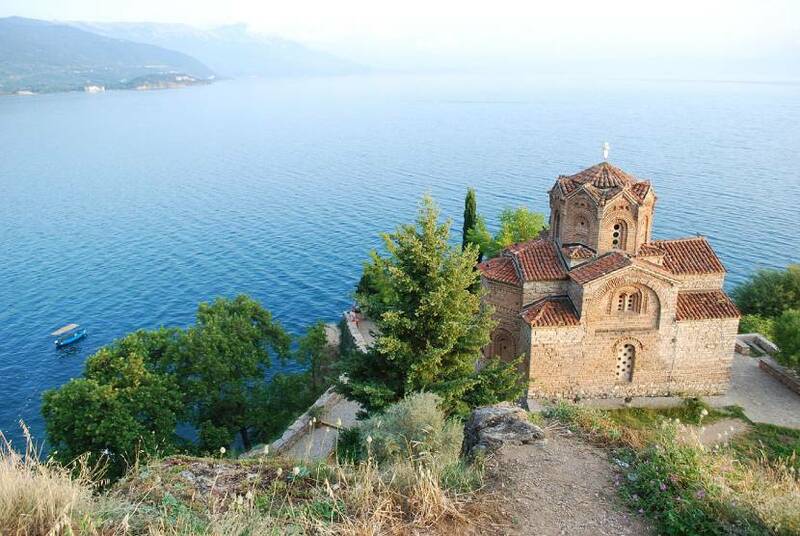 St. John at Kaneo might be the most beautiful church in Ohrid and its mostly because of its location – it is set on the cliff above the Lake and it gives a stunning view. 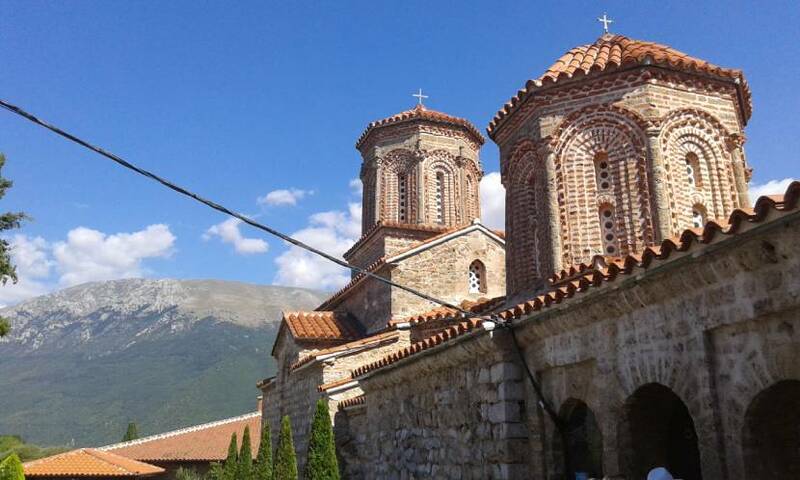 Another very special one is the Monastery of St. Naum – beautiful and very well-preserved monastery. 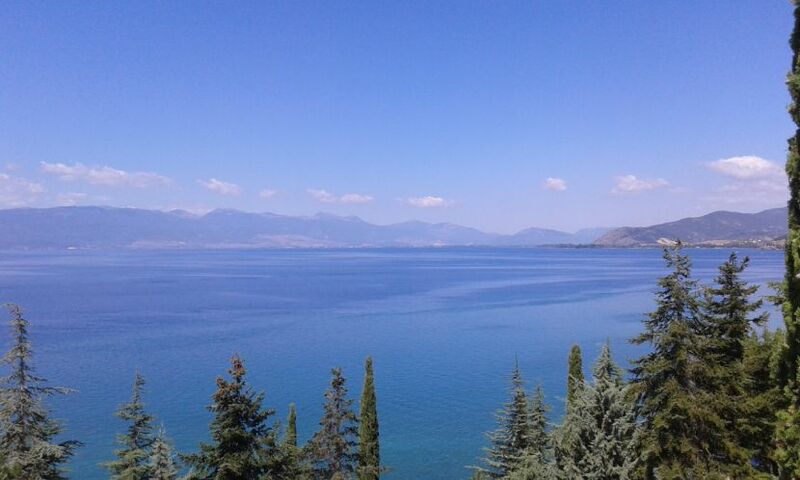 It is not located exactly in the Ohrid, but on the southern shore of the Lake, on the Albanian border, but it’s a very popular day trip from Ohrid. Many landmarks in the Old Town of Ohrid are protected by UNESCO, some of them being churches we mentioned above. Another one is Samuel’s fortress – medieval monument in Ohrid and it was a Bulgarian fortification. It is strategically set on the top of the hill, so it gives a breath-taking view of the city and the Lake. Also, there is the Ancient theatre of Ohrid from the time Hellenistic period that is a very interesting sight to see. 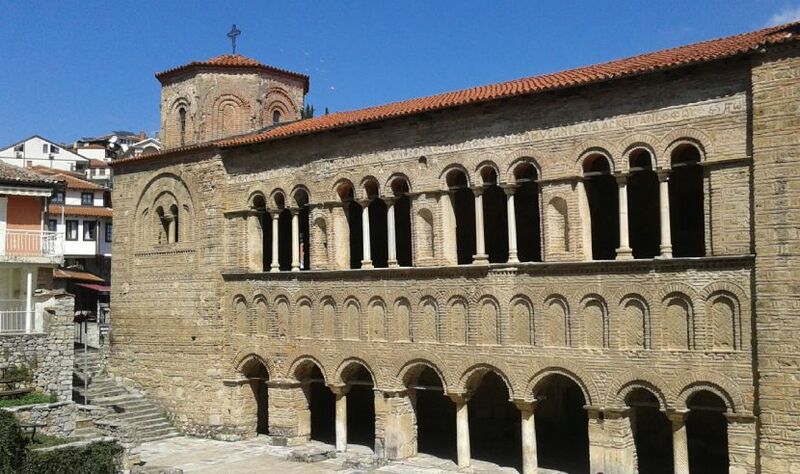 There are many things to do in Ohrid, besides exploring these old medieval landmarks. Beaches are awesome, so don’t forget to go swimming and sunbathing. The water is amazing and sparkly but pretty fresh and cold, so beware of that. Also, if you like hiking you can climb up to Galičica mountain and explore the National Park and enjoy nature. Also, if you like to party there is a lot to do. The cafes in the Old Town are usually open until 1 AM and after that, you can just go to some of the clubs and continue to party. Ohrid is a small city in a small and not-that-popular country but it really has it all and it’s pretty cheap. 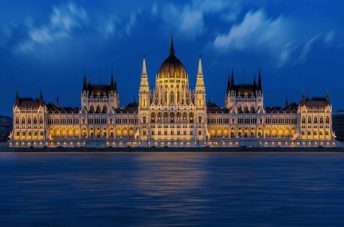 The beaches, natural wonders, amazing medieval landmarks, and of course nightlife – we’re definitely going back there sometime in the near future.